I ate a lot of squash with brown sugar and butter while growing up. This recipe is my more practical “I can’t have ice cream for every meal” compromise, using honey instead of brown sugar and coconut oil instead of butter. I would probably eat this as dinner on its own, but I happen to know it’s also great as a side with things like roasted chicken or pork chops. 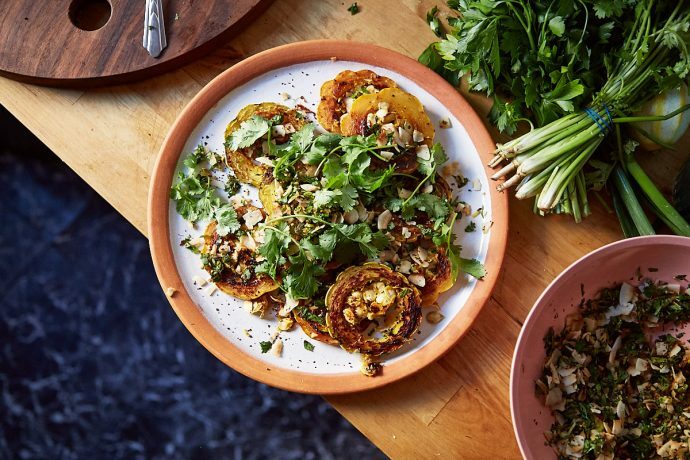 While tender, caramelized, salty-sweet squash is magnificent all on its own, it should be mentioned that the real reason for making this dish is for the toasted coconut gremolata: chips of nutty, unsweetened coconut tossed with herbs, lots of lemon zest, and a bit of Aleppo pepper. It’s wildly addictive, and there is no reason it couldn’t appear over roasted carrots, sprinkled onto a curry or stew, or even over salads as a stand-in for croutons.